Synthetic simulation of low-mass binary stars shows that 5% of them can cross the instability strip as Binary Evolution Pulsators (BEPs). Single star evolution does not allow extremely low-mass stars to cross the classical instability strip (IS) during the Hubble time. However, within binary evolution framework low-mass stars can appear inside the IS once the mass transfer (MT) is taken into account. Triggered by a discovery of low-mass (0.26 M⊙) RR Lyrae-like variable in a binary system, OGLE-BLG- RRLYR-02792, we investigate the occurrence of similar binary components in the IS, which set up a new class of low-mass pulsators. They are referred to as binary evolution pulsators (BEPs) to underline the interaction between components, which is crucial for substantial mass-loss prior to the instability strip entrance. We simulate a population of 500 000 metal-rich binaries using StarTrack synthesis population code, and report that 28 143 components of binary systems experience severe mass transfer (losing up to 90 per cent of mass), followed by at least one IS crossing in luminosity range of RR Lyrae (RRL) or Cepheid variables. All of them are form in low- and intermediate-mass systems, and with various initial orbital periods, as seen in Fig. 1. 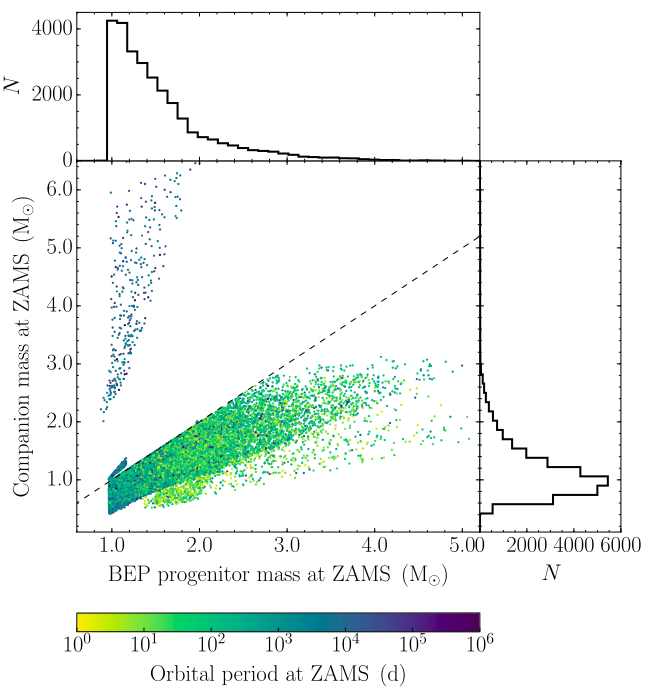 Comparison of initial masses of BEP progenitor and its companion, together with initial orbital periods coded with colours. Dashed line determines the mass ratio 1. Blue cone in the upper left part of the picture shows systems which undergo common envelope episode prior to the mass transfer. BEPs display a variety of physical and orbital parameters, so they were classified into one of three groups (Fig. 2): RGB-core – system that departed from the red giant branch due to the mass transfer before they ignited helium in their cores, and therefore their cores resemble ones of red giant branch stars, HeB-core – systems experience helium burning in their cores while crossing the instability strip. The resemble canonical RR Lyrae stars but they are binaries and most often cross the instability strip much earlier than their single-star analogues, AGB-core – systems that departed from the asymptotic giant branch due to the mass transfer or/and significant mass-loss via stellar winds before thermal pulses, and therefore their cores resemble ones of asymptotic giant branch stars. Exemplary evolutionary routes of BEP objects on the Hertzsprung-Russel diagram. Examples A1 and A2 have the shortest initial orbital period, while examples C1 and C2 have the longest. Companions’ tracks are omitted for clarity. 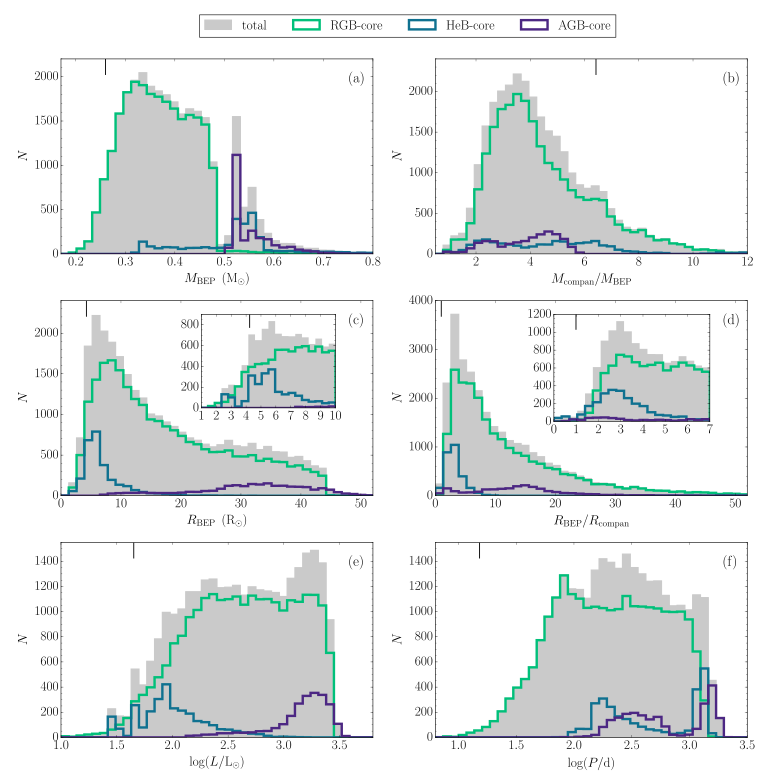 Parameters M and P above each plot describe initial mass of BEP progenitor and initial orbital period, respectively. Routes plotted with solid, dashed and dotted lines mark evolutionary stages of pre-core-helium burning, core-helium burning and post-core-helium burning phases, respectively. Asterisks denote core helium ignition. Shaded parts on tracks indicate mass transfer phases. Vertical strips denote location of the classical IS. 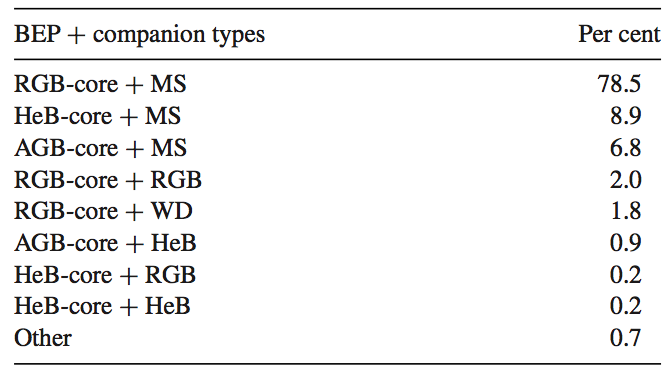 Different types of BEPs constitute the entire BEP sample in the following quantities: 82.4% for RGB-core, 9.5% for HeB-core and 8.1% for AGB-core. Table 1 gives even more detailed summary of BEPs and their companion types. Type of BEP and its companion: MS – Main Sequence star, RGB – red giant branch star, HeB – star burning helium in the core, WD – white dwarf. Six most important BEPs observables are collected in a form of Figure 3. BEPs – depending on type – show slightly different distributions of mass, mass ratio, radius, radius ratio, orbital period and luminosity. Altogether they are considered to have masses in range 0.2–0.8 M⊙, and the orbital periods in range 10–2 500 d.
The serendipitous discovery of the first BEP was made due to eclipses visible in the RR Lyrae-type light curve. Eclipses are not essential for BEP’s detection, but they are invaluable pointers to binary systems. Based on the light curve only, BEPs can be misclassified as genuine classical pulsators. We obtained two contamination values, for RRL and Cepheid stars, which set our exceptions on the fraction of undetected or misclassified BEPs among classical pulsators. These values are estimated at 0.8% for RR Lyrae stars and 5% for Cepheids. Although the percentage of undetected BEPs is larger than predicted by Pietrzyński et al. (2012, Nature, 484, 75), statistics-based measurements involving RR Lyrae and Cepheid variables should not be affected, as long as they rely on a large sample of variables. Detection of BEPs through eclipses is highly unlikely due to wide orbits and large differences in components’ radii. And yet, the first BEP was detected in an eclipsing binary. We suspect that in the future most BEPs will be exposed by their eclipses, because although eclipses among BEPs are so rare, they unambiguously reveal the nature of a binary.